I am extraordinary blessed because I live in Las Vegas! 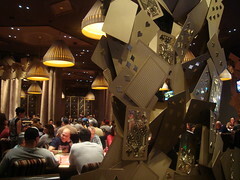 One of the top four poker meccas in the United States. Laughlin, Nevada has a half dozen poker rooms and is only 72 miles away. Add to that the dozens of poker rooms within 300 miles. Did I mention that Las Vegas also has Bar Poker as well? Perhaps the best thing about being in Nevada is that I can play legal, regulated on-line poker on the WSOP.com site. They have sites in two states: New Jersey and Nevada. While the numbers are small during the off season (when the WSOP events are not playing at the Rio Hotel and Casino), there are enough players to try improving my skills at cash games, Sit and Go’s (SnG’s), and Multi-Table Tournaments (MTT’s). Satellites to the WSOP events usually start a few months prior to the WSOP events at the Rio and run right up to the World Series of Poker Main Event. I have always wanted to play in the World Series of Poker but felt that the buy-ins were beyond my bankroll. Until now! The WSOP 2015 has added a new game to the 2015 series – “The “Colossus”! I can fire one bullet without bankrupting my bankroll. There is even the possibility of satelliting into the event at an even lower price. I can describe my poker abilities as being a recreational player, which means that I am not a winning player and that I have to add to my bankroll from my personal finances from time to time. Be assured that that my poker money comes from my personal funds that I earn for that purpose and that I do not use household funds to support my poker playing. This is very important and something that I am serious about. I have been in Vegas for over two years now and the closest I have gotten to the WSOP events was being at the rail, watching others try their skills and luck (some luck is required no matter how much skill you have). But, now, I am almost ready to play a WSOP event at the Rio this summer. The Colossus. In order to prepare for the event, I have started walking daily, starting at an hour a day or two miles and will build up to three hours a day or six miles a day by the end of February. I also am playing on-line: at least six Sit and Go’s to build up my playing skills. Starting in February, I will be playing at least two live SnG’s at our local casinos and a weekly MTT event. I also will reach out to friends and acquaintances that I have made as a member of PocketFives.com for advice. I have over five months to get ready for an event that may run for over 12 hours a day or more and could take at least three to five days to complete. How do you get ready for events that you play in? There is nothing that I find more upsetting than bullying at the online poker tables. This comes in the form of snide remarks and some times in veiled profanity, like breaking up the works “you are stu pid” or even stronger profanity will escape the notice of the client software that would ban such language. Finally I had enough and sent the chat to an online poker site saying that their programming should take care of this. Being a programmer in my past life, I know that this is doable but that it adds to the client overhead. I am very sorry to see you had an unpleasant experience at one of our tables. I will look further into this situation and take the necessary action. We do strive to provide a pleasant and fun experience for our players and encourage anyone to let us know when another player is being inappropriate. We will investigate this, but in the future if another player is being overly inappropriate we do have the mute option so you can continue to enjoy the game without the disruptive actions of others distracting you. I truly hope this covers everything. Please let us know if there is anything else we can assist you with. Thank you and have a wonderful day! Turning off the player chat should not be the option. Abuse talk and behavior is not allowed in live poker rooms and should not be tolerated online either. What are you thoughts about the subject? Should Poker Sites that announce a Daily guaranteed game but fail to run or start that game let their players know why? For instance, an online poker site in Nevada announces a poker tournament with a guarantee will run at 18:00. But on or after 18:00, that game does not appear on the canceled list. Public inquiries using Twitter are made but no responses. The only part that answers is support via email and the usual answer is they are sorry it did not run. No explanation is given. Should not the online sites be more transparent? Before FullTiltPoker collapsed, they did not answer anyone. This does not make for a very friendly atmosphere for the players. What are your requirements for the sites. P.S. Actual physical address and phone number left out to protect the innocent! Disclaimer: Opinions and ideas expressed on DadsPokerBlog and MyOwnPokerBlog are mine and mine alone. On April 30, 2013, Ultimate Poker started up, on a trial basis, offering No Limit Hold’em and Limit Hold’em to anyone physically located in the State of Nevada, citizens and visitors alike. The State of Nevada had passed bills legalizing the playing of poker online. I think this was done because it appears that the U.S. Government was not going to pass bills allowing online poker on a nationwide basis. The start of Ultimate Poker was not smooth. The client software crashed and failed a lot during the trial testing period. This could happen if you were playing in a cash game, a Sit and Go (SnG) or even a tournament. The only recourse was to notify, via email, PlayerCare@UltimatePoker.com and wait for a reply. Ultimate Poker (UP) was deluged in a sea of emails. Not only did the client software crash but the required Geo-location aspect failed for a variety of reasons. Your cell phone had to be found in the borders of Nevada and the cell phone providers had to allow for this type of activity. AT&T worked, Verizon Wireless did not. Some of the smaller carriers worked, but not all did. Credit card deposits did not always work. Visa had the most declines. Prepaid MasterCard worked most of the time. Because UP was affiliated with Station Casinos, that was not a problem. You could go to the cashiers cage at any of the Station Casino’s and make a deposit. All you needed was cash, a valid id from any state or country and an email address. Once the deposit was made, you would receive notification via email of the deposit and you were good to go play. 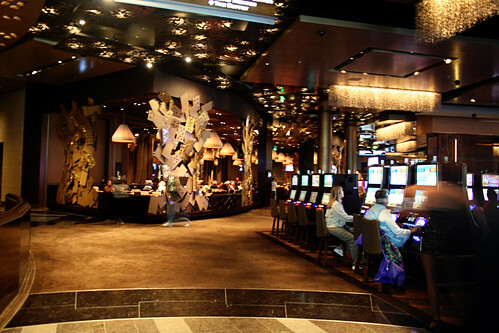 Withdrawals would be just as easy and could be picked up at the casino cashier cage as well. While over 10,000 may have signed up with Ultimate Poker, only a few hundred or so played at any given time, causing delays in starting SnG’s. Tournaments ran as scheduled but you had to sign up before the tourney started as there was no late registration built into the early software. The initial social media tools, Twitter and FaceBook, were not manned 24 hours a day, seven days a week even though their site ran 24/7. Ultimate Poker was unprepared for the onslaught of Tweets that players would send, both good and bad. That caused some bad feelings with some new players to the site. It was as though the company did not care enough about their customers to respond to their concerns. That was not true, as Ultimate Poker did not expect to be so busy out of the gate. But, first looks are what customers remember. Diane and I contacted Chris Danek, Poker Product Manager for UP and offered our assistance. He declined, thankfully so, as we later found out that employees are not allowed to play on their own site. Both Diane and enjoy playing online poker. UP started ramping up the support group and had the capable and very likable Terrance Chan, Director of Player Operations to assist with support. Terrance actually responded in person to some of my earlier emails to support and he and Chris Danek responded to individual Tweets. Tweets were being answered reasonably quickly from 8am to 5pm and eventually almost on a 24 hour a day basis. Some holidays and weekends were a little skimpy with UP tweet responses but the heart of UP, Joe Versaci joined in to help respond to questions, concerns, and complaints. Move forward two software versions and seven months later. Emails are responded to automatically as an acknowledgement with a real human response within 24 hour or less, usually within two hours. The company uses Twitter, Facebook, YouTube, Google+, TwoPlusTwo Support forum, and PocketFives.com (JT From UP), to communicate and deliver education to enhancement the player experience. As is the case in the real world, you can not please everybody. I am currently doing some paid, freelance reporting and posting for and on, PocketFives.Com. I try to summarize the weekday and weekend tournament activity for events with a guaranteed payout of $1,000 or more. Sometimes I am unable to find the results for a particular regularly scheduled tournament. I would send Tweets asking what happened, but sometimes I would get absolutely no public response. Instead, I would find out from an informed source that a technical problem happened or that not enough people signed up and the event did not run. Many tournaments have a minimum number of players needed to start, as well as a maximum number allowed. My concern is that the site, Ultimate Poker, should be more upfront when things go wrong or when tourneys are not able to start. I can see in the UP tournament lobby the tournaments that were canceled, but not the ones in question. I think the company should be more proactive and let players know via Twitter and Facebook that an event was cancelled. Being open and transparent should be their goal. I know that the world is not perfect. I am not perfect. I don’t expect UP to be perfect. But, when asked an operational question, I expect that UP should respond in a timely manner. The cancelling of a tournament or SnG or cash game is an operational event. I don’t expect responses from general gripes or complaints. Am I being too severe in my expectations?